Manuel Neuer's rise to become both FC Bayern München's, Germany's undisputed No1 and a 2014 FIFA World Cup winner has come as little surprise to those who know him. The goalkeeper was born on 27 March 1986 in Gelsenkirchen, home of FC Schalke 04, and his talent was discovered early on. After joining the Royal Blues at the tender age of five he worked his way inexorably through the ranks of their youth system. Schalke were so sure of Neuer's ability to make the grade that they handed him a huge seven-year professional contract at the age of 19. Neuer made his senior debut for the club in August 2006 and went on to establish himself as Schalke's first-choice keeper later that season. His rise to international prominence was accelerated in March 2008 by a string of spectacular saves against FC Porto in the last 16 of the UEFA Champions League, before stopping two penalties in the shoot-out to help Schalke reach the quarter-finals. Neuer's consistently excellent performances, along with his incredible distribution - throws that reach the half-way line to launch swift counterattacks - did not go unnoticed by Germany coach Joachim Löw, who handed him his international debut in June 2009. An injury to designated first-choice national team keeper Rene Adler gave Neuer the chance to take over the No1 jersey at the 2010 FIFA World Cup in South Africa. His assured performances there, followed up by another excellent season at Schalke, earned him a move to German record champions FC Bayern in summer 2011. He had to wait a good while to get his hands on silverware, though, with Bayern finishing runners-up on three fronts in his first season before making amends a year later, smashing record after record en route to an historic treble. 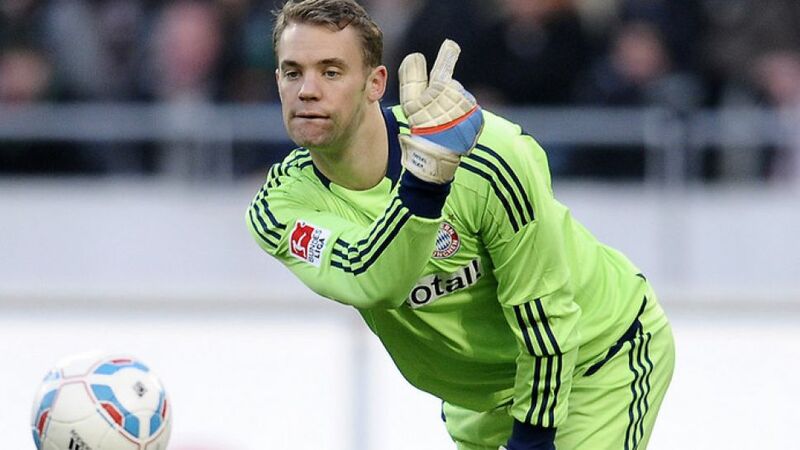 Neuer went on to win the FIFA Club World Cup with the European Champions the year after and saw his outstanding performances also come to personal avail in January 2014 as he was named 2013 World Goalkeeper of the Year by the International Football Federation of History and Statistics, as well as a in 2013 FIFA FIFPro World XI. "It’s such a great honour for me to be voted into the World XI and to be mentioned in the same breath as other great goalkeepers," commented Neuer. However, that honour looks likely to be bestowed upon on the Gelsenkirchen-native for several years to come. Having been one of Germany's standout performers in the 2014 FIFA World Cup, Neuer not only picked up the FIFA Golden Glove award for his exploits in Brazil, but also started the 'Sweeper Keeper' sensation with his dynamic performances, which saw him complete more passes (244) than Lionel Messi (242) throughout the competition. As further recognition for his incredible influence for both club and country during the 2014 calendar year, Neuer was named in the final three-man shortlist for the 2014 FIFA Ballon d'Or award alongside the aforementioned Argentinian and Real Madrid CF's Cristiano Ronaldo. However, his standout performances weren't enough to earn him top spot in the vote. Neuer, whose favourite drink is a Spezi - a mixture of cola and orange - also took part in a celebrity episode of 'Who wants to be a millionaire?' in November 2011. The articulate keeper showed his mental dexterity in answering all but the final question to win €500,000 for charity, proving it really is difficult to put anything past the Bayern and Germany custodian.